'Star Wars' and 'Game of Thrones' have given Ireland an unprecedented stint in the TV and movie spotlight - but they're just the opening reel. Movies and TV shows are a huge driver of travel - inspiring up to 35pc of visitors in their choice of destination, according to Tourism Ireland. It helps then, that Ireland has such a rich repository of locations to offer and visit - from classics like 'The Quiet Man' and 'Ryan's Daughter' to more modern hits like 'Derry Girls', 'Father Ted' and erm... 'Leap Year'. Here are some of the best movie and TV locations to visit in Ireland. Skellig Michael was already iconic. When the Millennium Falcon swooped in over the Atlantic on its way to Ahch-To in 'Star Wars: The Force Awakens' (2015), however, we knew Ireland was in for some dazzling big screen exposure. 'Star Wars: The Last Jedi' (2017) amped it up another level, with long scenes filmed not just in Kerry, but Malin Head in Co Donegal and on the Dingle Peninsula. Fans taking light sabers and Jedi cloaks to Skellig Michael is just the start of it, a 'May the Fourth Be With You' festival is now an annual event. 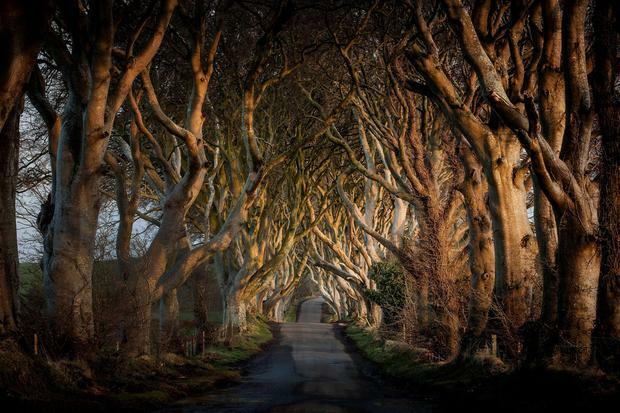 They may have appeared in 'Game of Thrones' for all of a few seconds - when a cart carrying Arya Stark and friends trundles down the King's Road in series 2 - but these swirling beech trees have become Northern Ireland's most iconic filming location. The atmospheric avenue was first planted by the Stuart family of Gracehill House in the 18th century, but they could scarcely have imagined how dramatically those branches would twist and turn in the ensuing centuries. The thin tunnel of trees has highlighted the problems of screen tourism too, with traffic becoming an increasing issue as 'GoT' grew into the biggest TV show on the planet. Millennials could be forgiven for wondering how this dinosaur makes any list of the best movie locations in Ireland. But John Ford's classic, first released in 1952, is one of the most influential screen tourism hits of all time - and boy, has it stood the test of time. The movie itself has dated, but the locations seem as strong a draw as ever - from Ashford Castle, where John Wayne and Maureen O'Hara stayed, to the 'Quiet Man Bridge' at Lough Boffin and a museum and tours in the town itself. The scenes involved members of the Reserve Defence Force, stunts, explosions and more in depicting one of the bloodiest battles in history, and one of cinema's most memorable opening acts. Curracloe was voted Ireland's Favourite Beach in the Independent.ie Reader Travel Awards 2019. 'In the Name of the Father' (1993) was director Jim Sheridan's take on the story of the Guildford Four - four men falsely convicted of the 1974 Guildford pub bombings. Many of the jail scenes were filmed at this historic location, but it's not just Daniel Day Lewis and Co who have breathed new life into the creepy old interiors. Kilmainham has also featured in 'The Italian Job' (1969), 'Michael Collins' (1996) and 'The Wind that Shakes the Barley' (2006), among others. It closed its doors as a prison in 1924, but is one of Dublin's top visitor attractions today. 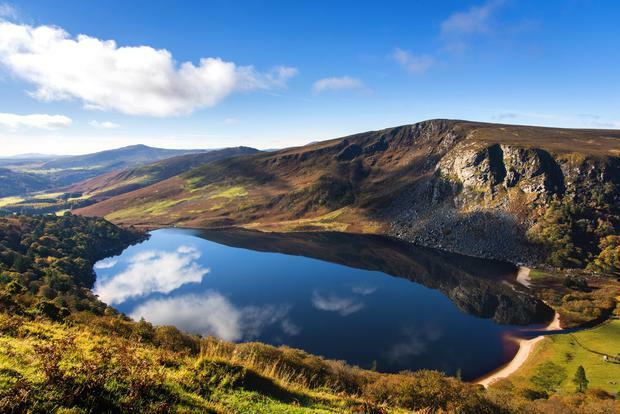 How is this lovely lake not the star of every single movie filmed in Ireland? The Wicklow wonder does feature in several, however - thanks both to its good looks and handy location close to Dublin and Ardmore Studios. 'Vikings' (since 2013) is the most recent, though this was also a setting for 'Leap Year' (2010), 'Becoming Jane' (2007) with Anne Hathaway and a famous scene in John Boorman's 'Excalibur' (1981), when the legendary sword is finally grasped by the rhinestone-encrusted hand of the Lady of the Lake. Wicklow, once dubbed "the Hollywood of Europe" by Jane Seymour, is home to oodles of famous movie and TV locations, ranging from 'Michael Collins' (1996), with a pivotal scene in the square at Rathdrum, to 'Dancing at Lughnasa' (1998) and 'Camelot' (1967). Powerscourt and Killruddery House ('The Tudors', 'Camelot', 'Far and Away' and 'My Left Foot', among others) are two of the top big house movie locations in Ireland. It's tricky to choose just one location from 'Father Ted', but if we were pressed, the parochial house itself would have to be it. Glanquin Farmhouse is home to the McCormack family and - go on, go on - you can book tea and treats there from €10pp (advance bookings only, fathertedshouse.com). Other great locations in West Clare include the Very Dark Caves (Aillwee Caves), the Holy Stone of Clonrichart (The Burren) and further afield, Inis Oírr, which doubles as Craggy Island in the opening title sequence. It's hard to believe the show aired just 25 episodes, from 1995-1998. "It was the best government we ever had," a local lady once told me. "It put Dingle on the map." It was 'Ryan's Daughter' (1970), an old-school epic as richly associated with Co Kerry as 'The Quiet Man' is with Connemara. David Lean's classic was a game-changing production for the west of Ireland, showcasing the Atlantic scenery around Dingle and Dunquin to dramatic effect - and winning Freddie Young an Oscar for cinematography. More talked about than watched these days, the movie pits a triangular love story starring Robert Mitchum and Sarah Miles against the backdrop of 1916. Another key location is the breathtaking Inch beach. Is 'Derry Girls' this generation's 'Father Ted'? Viewer reception has been rapturous, critical reaction a little more tempered, but one thing's for sure - Lisa McGee's irreverent sitcom has done something that would have seemed impossible in the 1990s: got people talking about the city for a positive reason. You'll recognise lots of locations, including the 400-year-old City Walls and Derry's infamous murals, now joined by a giant depiction of the girls on Badger's Bar on Orchard Street. The Cliffs of Moher have appeared in numerous movies, including 'Harry Potter and the Half-Blood Prince' (2009), 'Leap Year' (2010), 'Into the West' (1992) and 'Hear My Song' (1991). Our favourite has got to be their role as the Cliffs of Insanity in Rob Reiner's meta-fairytale fantasy, 'The Princess Bride'. A brief but brilliant cameo. Brendan Gleeson's masterpiece? Fans of 'Calvary' (filmed in Sligo) might argue the point, but we love this depiction of an unorthodox garda and his misadventures throughout Galway and Connemara. Remote locations heighten the sense of surreality faced by Don Cheadle's FBI agent when he arrives to investigate, and you may also recognise a saucy cameo for Galway's g Hotel. Connemara, unsurprisingly, has been the location for many movie shoots over the years, ranging from 'The Quiet Man' (1952) to 'The Purple Taxi' (1977), 'The Field' (1990), 'Black 47' (2018), TG4's 'Ros na Rún', as well as 'Marley And Me' (2008), where Owen Wilson and Jennifer Aniston's antics included getting stuck behind a flock of sheep at Lough Nafooey. When the clouds clear, blue breaks through and sunshine spills over the cove, Co Wicklow's Silver Strand could make the cover of 'Condé Nast Traveller'. This is a private beach, which you pay to access through a camping park on the R750 south of Wicklow town - but it's worth it. Descending the steep steps towards the cove, you'll find caramel sands, electric green water and splashes of ivy, grass and honeysuckle tumbling down the cliffs. Amazingly, Silver Strand doubled as the Cote d'Azur in 'The Count of Monte Cristo' (2002). Some 26 'Game of Thrones' filming locations are accessible to the public in Northern Ireland. They range from Ballintoy Harbour (the Iron Islands) to Dragonstone (Fair Head and Downhill Demesne), the Dark Hedges (above) and beyond. Castle Ward is among the best known, not just thanks to its role as home to the Starks at Winterfell but its evolution as a tourist attraction. Today, you can take a tour of the property, dress up in costume and even shoot arrows on the Winterfell Archery Range. (gameofthrones-winterfelltours.com).